Customise the content, logo and colours! Are you managing multiple webshops? We’ve got you covered with the ability to change the styling of the page per webshop. Your customers won’t be sent to the Track & Trace page of the carrier, but instead will see your Track & Trace page. The steps below explain the options and configuration of the Track & Trace page. To use our new Track & Trace page you have to switch once. You can do this by going to settings - track & trace in your SendCloud account. Then click on "Customer communication". At the top you see banner, by clicking on free upgrade you get direct access. We have already set up a standard Track & Trace page for you. You can view these via settings - Track & Trace page. It all starts with setting up your brand. By navigating to the settings of your SendCloud account you’re able to add a brand. We strongly suggest to add your logo. This will automatically be displayed on your Track & Trace page as displayed below. In your brand settings you also have the option to select a brand colour. The brand colour will be used as the colour scheme on your Track & Trace page. We’ve created two design options for the look and feel of your Track & Trace page. Both apply your brand colour in the colour scheme on the page. The image above shows the default design. The logo on the top right is based on the carrier handling the parcel, along with the carrier van. Are you curious to see how the page will look for your customers? Use preview! Click the ‘preview’-button located top left in the menu bar. This will show a live preview of how your page will look. 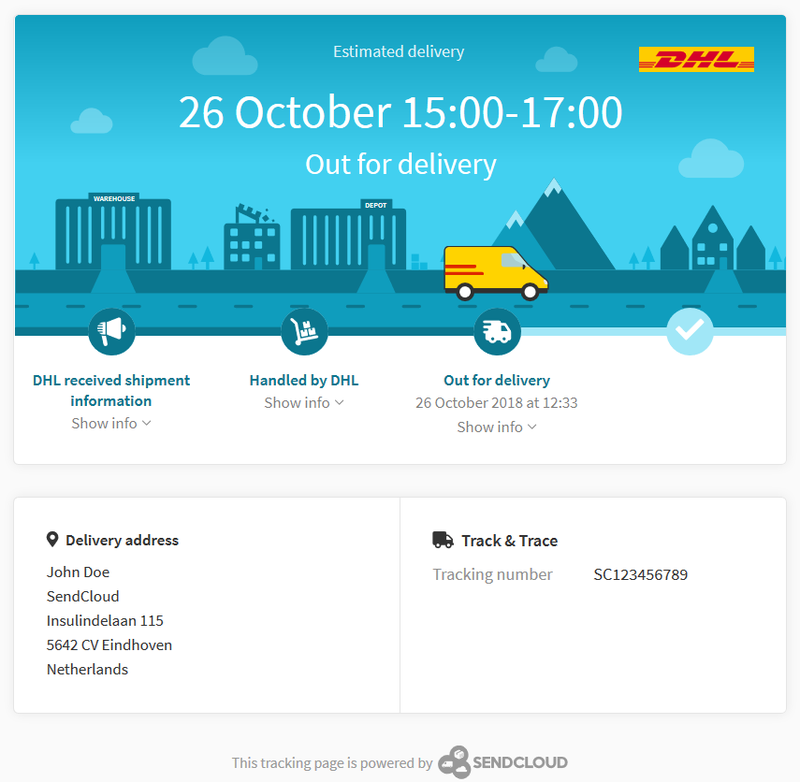 Customers will be able to see more details of the shipment by clicking on show info’. Before you publish your page, we recommend previewing the page by clicking on the ‘Preview’-button. If you’re not fully satisfied with the page, you can save it as a draft and finish it later. When you’re fully satisfied you can publish the page by clicking ‘Publish’. This way the page will be live for your customers. The following features are only accessible for SendCloud Plus users. You can determine the design of the Track & Trace page by choosing one of the various options we offer. 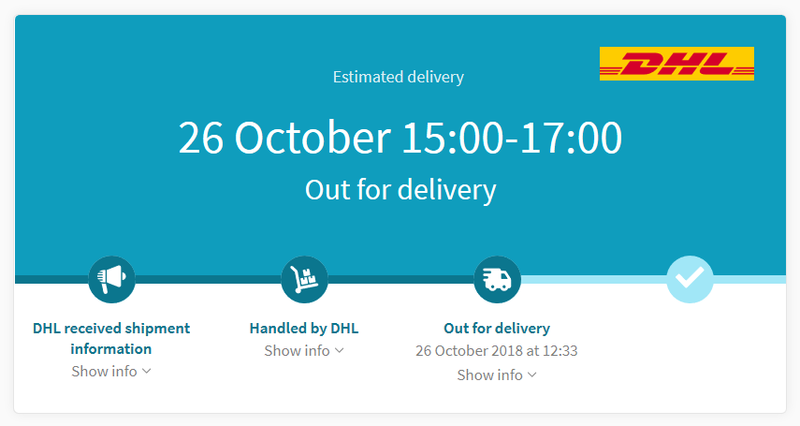 Standard: timeline of your parcel + parcel information. 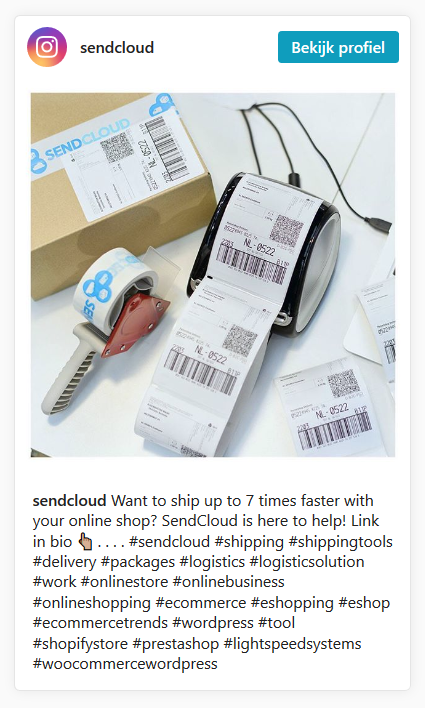 Instagram post + branding banner: besides the Track & Trace information you have the option to add an Instagram post and to add a branding banner (with, for example, a discount code). Instagram post: add only an Instagram post besides the Track & Trace information. Branding banner: add only a branding banner besides the Track & Trace information. You want to do whatever is possible to make sure customers return to your webshop for future purchases. 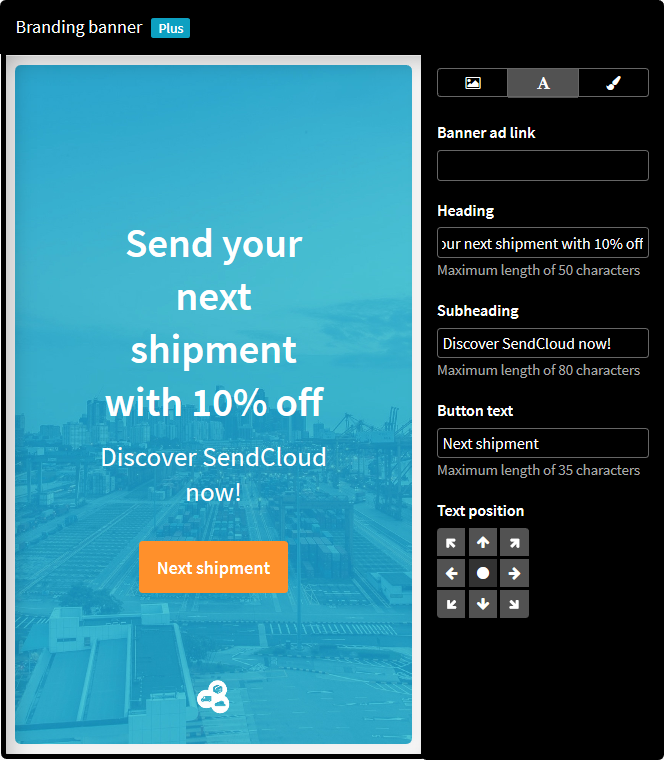 Using a banner ad on your Track & Trace page is a effective method for brand building and/or launching new products and/or services. The banner can also be used to offer a discount code for future purchases. What are the options of customising your branding banner? Are you active on social media? Then our Instagram widget is made for you. With this option you can update your customer using an Instagram post on your Track & Trace page. This widget is also very suitable for brand building and/or the launch of new products and/or services. Make sure your post is set to public so page visitors can see the post. This widget supports Instagram posts containing a single picture. Slideshows and videos aren't supported. If you have further questions, please contact us via the contactform within the SendCloud panel.